My mom took Piper with her this morning to run some errands and they ended up at the mall. I guess when they got there, Piper saw Santa and said she wanted to give him a kiss! 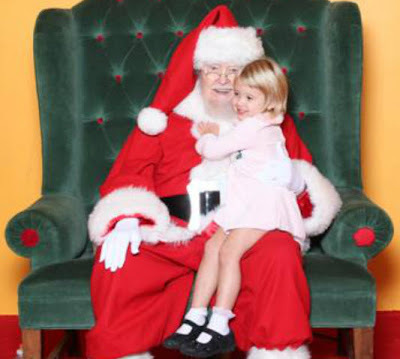 Now Piper has never actually met Santa before. I took Caroline and Bryce when they were aged 2years/3 months and 3 years/15 months (photo disappeared) from blog) and they were less than enthused about it so I didn't really want to force anyone into Santaville. I guess Piper had her own curiosity and after professing her love for Santa the other day seeing him on TV, I'm not surprised. My mom said she got right up there and wasn't the least bit scared. The photo to the left is one I snagged from the website - my mom got the real photo package. I can't wait to hear her talk all about it when I get home today. I wonder if the older two will have any interest??? Although I must say, this Santa does look a little worn out. I like my Santas to be a little more robust instead of having to be worried about his health, but I guess you can't pick Santas, can you? And I just love how she's dressed! Ever since my mom used to watch just Caroline as a baby, she would always dress her up special to spend the day. 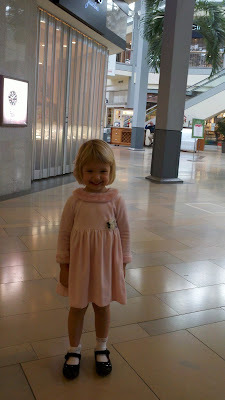 Well, today was no different and Piper wore the little pink, velour dress that used to be Caroline's at that age. Here's a photo my mom took of her cruising the mall. Although I think Piper is a little taller, hence why the dress is so short. But she has such cute little legs! That little girl cracks me up!! !